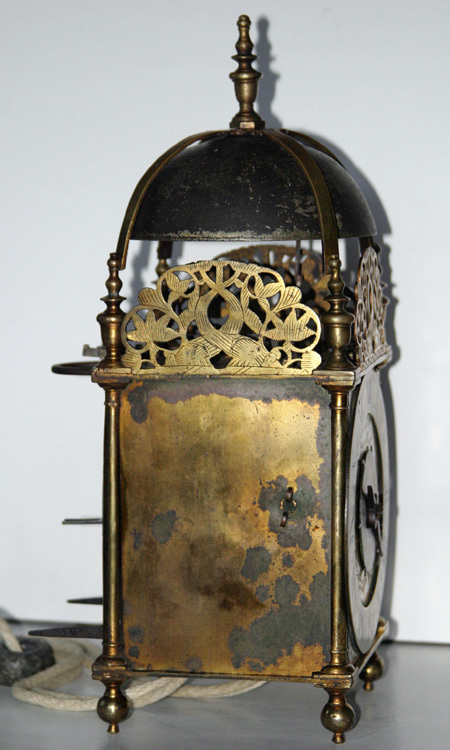 A very fine, Charles II, gilt brass lantern clock. The dial plate with early tulip engraving and carrying the maker's signature 'Benjamin Hill in Fleete Streete Londini'. Single pierced iron hand. The narrow, silvered chapter ring with Roman numerals and inner quarter hour track with wheatear half hour markers enclosing the centre with silvered Arabic alarm setting dial with starburst engraving. 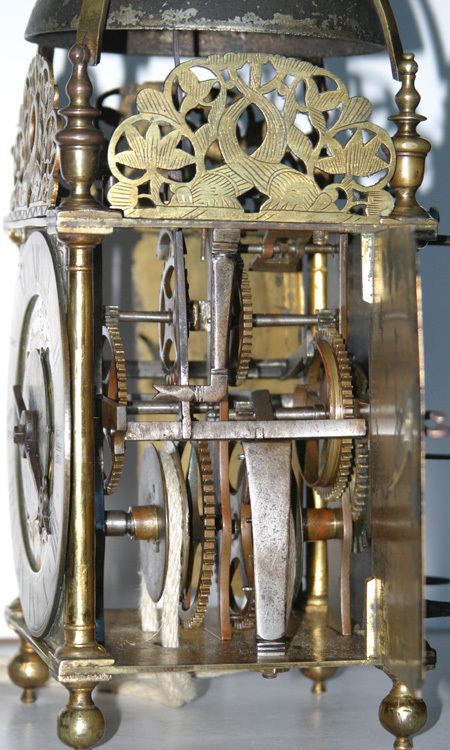 The two train, weight-driven movement with countwheel strike, early anchor escapement and single continuous Huygens winding rope. The strapped bell over urn finials and three cast pierced frets engraved with crossed dolphins and floral motif, supported on tapering Doric columns to turned ball feet. 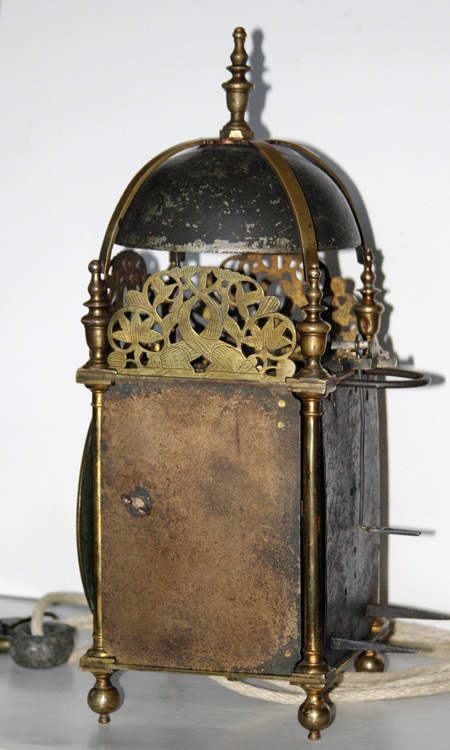 Hinged gilt brass doors, iron backplate to rear, hanging hoop and spurs to ball feet. 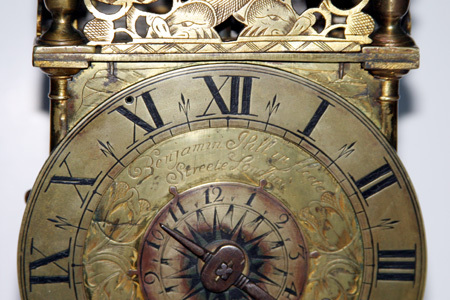 The mercury gilding to the dial and frame has partially survived and is a very rare feature. The clock was originally balance wheel and has a very early conversion to anchor which is retained (this conversion is common and also involved the removal of the alarm work). 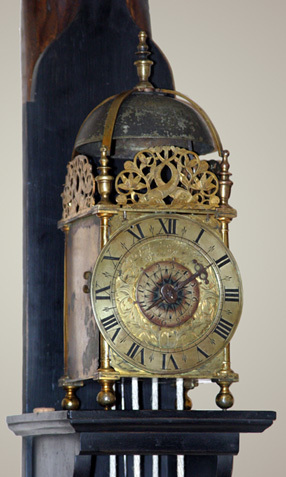 Apart from this, the clock is very original except for the top finial and a door handle which were added during conservation. The clock keeps excellent time and, as with most of these early clocks, has a 12 hour duration. 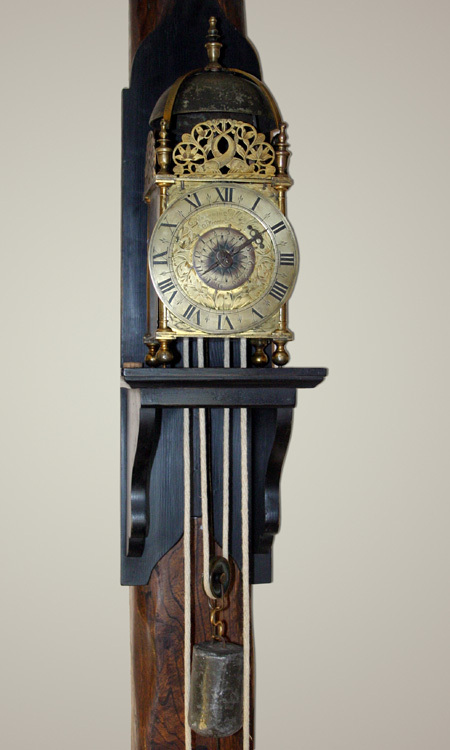 The clock is of standard lantern clock proportions, standing 15" high to top of bell finial with 5 3/4" square frame and 6 1/4" high engraved dial plate. Benjamin Hill apprenticed to Richard Child, Blacksmiths Company, and then Clockmakers Company freed 1640 and died 1670.